See a short demo on how to use RFM analysis, or keep reading the step-by-step guidance. In sales and marketing, a correct targeting is often the key thing that makes a deal or a promotion campaign successful. That is why it is useful to have a technique for dividing customers into segments. Answers to these questions allow you to identify your “best customers”, “worst customers” and any required number of segments between them. It is well-known that 20% of customers bring 80% of the business’ profit. That is why, having identified which customers constitute the most profitable 20%, you can focus your promotional efforts where you will get the best return. At the same time, knowing your worst customers, you can develop retention and reactivation campaigns to engage this segment more and,as a result, strengthen your customer base. Define the same number of ranks for each parameter (this is a traditional approach). Do not define too many ranks. Segments must be large enough to be statistically valid, therefore 3–5 ranks usually bring the most sensible results. However, if you have a great number of customers, you may need to use more ranks. Use data analysis methods, such as calculating the percentiles, to correctly identify segment thresholds. Make sure that segments do not intersect. 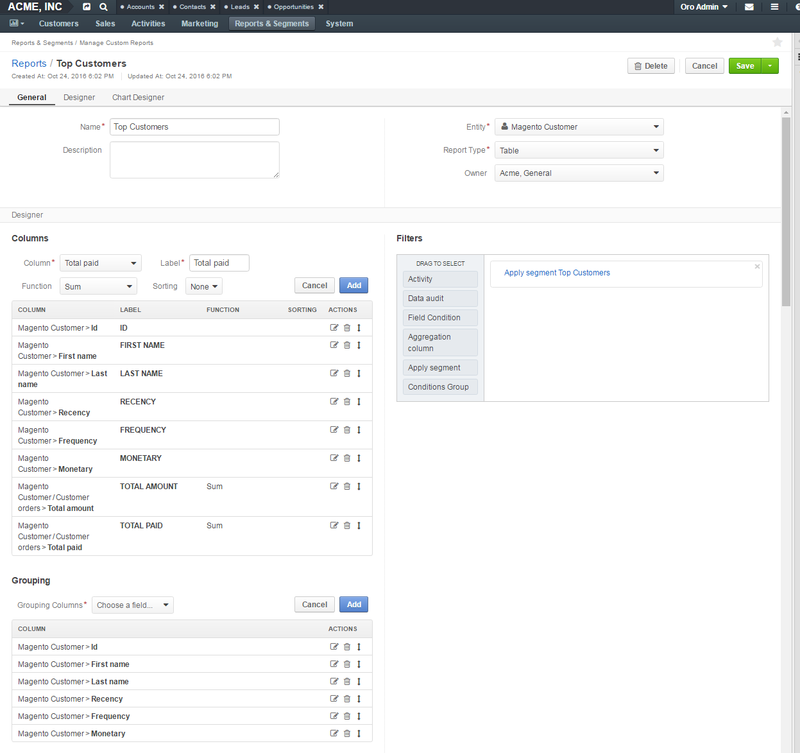 In OroCRM, this step is performed by the system administrator and is described in the Configure RFM guide. In step 2 each customer is assigned corresponding ranks. OroCRM performs this step automatically when segments are defined. The three ranks together are called an RFM cell. In step 3, you study RFM cells. This can help you determine (among other things) which promotions are better for which customers. John Dow makes frequent and small orders. An upselling/cross-selling technique can help make this customer more profitable for the store. Jane Row made many orders on regular basis and spent a significant amount of money on them. However, she has not returned to the store for some time. A reactivation promotion may help her switch back to making orders in your store. For how you can study the RFM metrics with OroCRM, see the How RFM Data is Used section below. When sales or customer service staff contacts a particular customer, the RFM information can help them make better decisions. For this purpose, a customer’s RFM metrics can be easily accessed from the customer or account views. 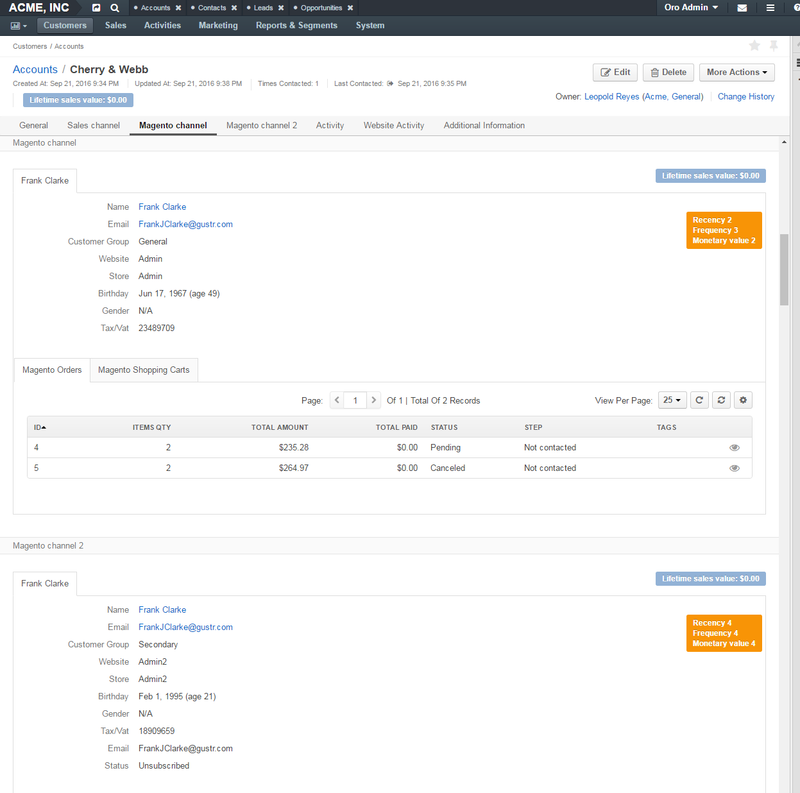 To simplify the creation of marketing lists and reports, you can create a customer segment based on RFM metrics, and reuse it wherever required. You may want to define a segment which comprises customers that made orders frequently in the past but show no recent activity. For instance, let us assume, it is those whose recency is 4 and lower (5, 6, etc) and frequency is 3 and higher (1,2). Make this segment dynamic and it will be automatically updated as soon as new data appears in the system. Select customers’ identifiers (ID, first name, last name, etc.) and the recency metrics as the report columns. Filter data by the recency and frequency values (the combined filter should have the following values: Recency >= 4 AND Frequency <=3). When you decide to start reactivation campaign and begin creating a marketing list, specify that you want to include only customers belonging to a particular segment into it. 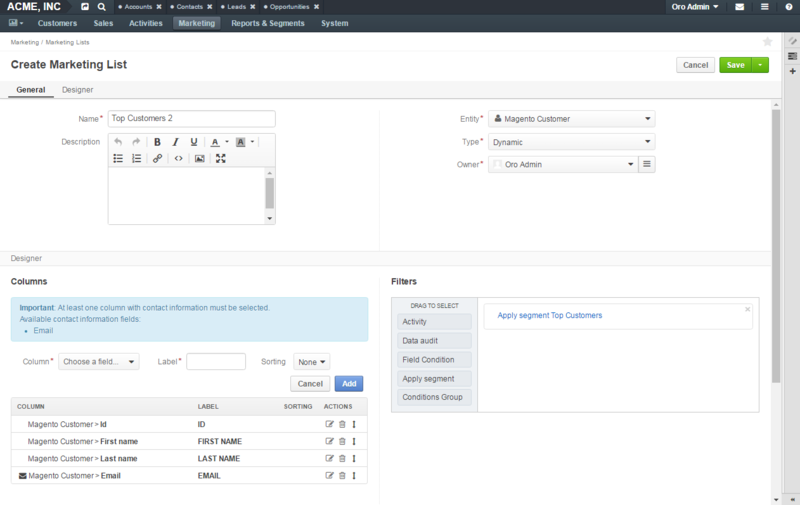 To do this, use the Apply Segment filter on the marketing list creation form. For more details about segments and their creation, please see the Segments guide. Another useful segment includes your best customers. Assuming you consider those who fall into the RFM cells 111, 112, 121, 122, create a segment as described in the Example 1 of this section, but in step 3, define Recency = 1 AND Frequency <=2 AND Monetary <=2 for a combined filter. Let us assume that you regularly run upselling marketing campaigns that include sending promotional offers to your top customers. 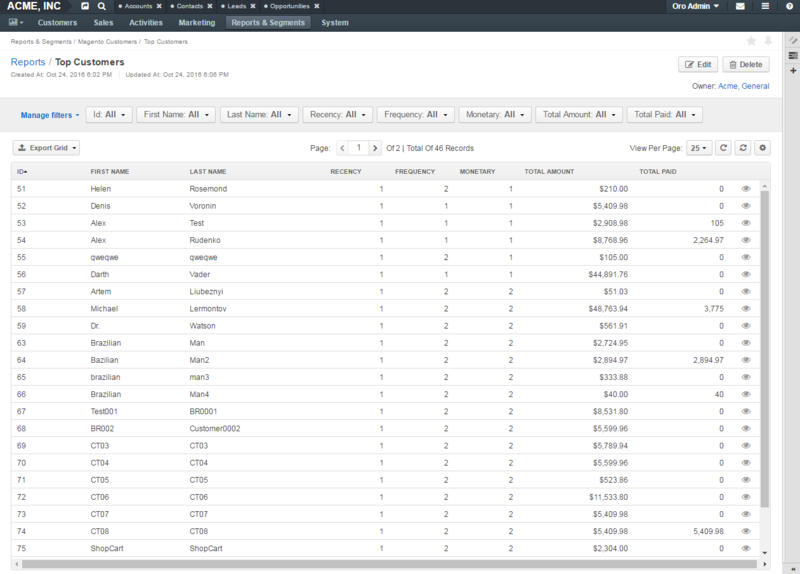 You can create a dynamic marketing list based on the filtering customers by RFM metrics. This list can be reused and will always contain actual data about the top customers. Select customers’ identifiers (ID, first name, last name, etc.) and contact information as the report columns. Filter data by the recency, frequency and monetary values (the combined filter should have the following values: Recency = 1 AND Frequency <=2 AND Monetary <=2). 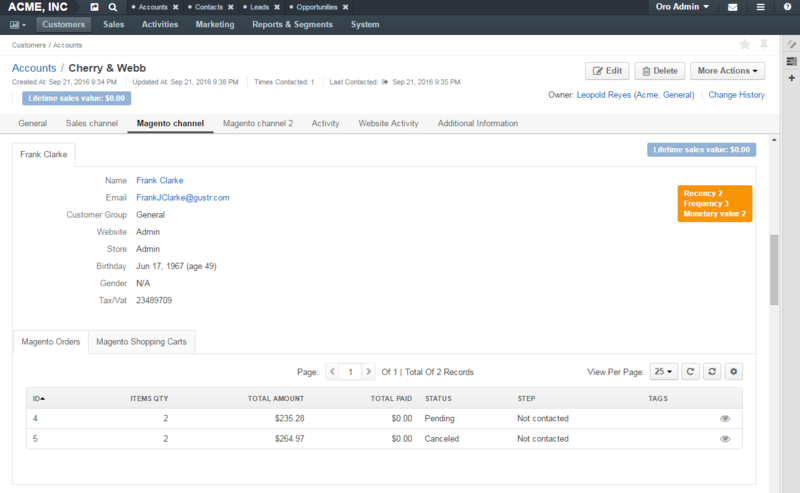 To simplify creation of the marketing list, you can filter data using a predefined segment. Assuming that you have created the “Top customers” segment as described in the Example 2. Top customers segment , in step 3, instead of applying individual filters to recency, frequency and monetary values, use the Apply Segment filter and select the “Top customers” segment for it. For more details about marketing lists and their creation, please see the Marketing Lists guide. In developing business plans, marketers and business owners usually rely on the information from reports. Reports based on the RFM metrics can help them create a fine marketing strategy and set adequate goals. You can build a simple report that shows RFM cells for each customer. To create such a report, select RFM metrics and the customers’ identifiers (ID, first name, last name, etc.) as the report columns. Apply sorting to the RFM metrics fields to show RFM cells in the rank order. Another report may show your top customer, the total amount of all their orders and amounts paid. Select customers’ identifiers (ID, first name, last name, etc. ), RFM metrics and the totals as the report columns (do not forget to add all the fields that do not have a function assigned to them into the Grouping section). 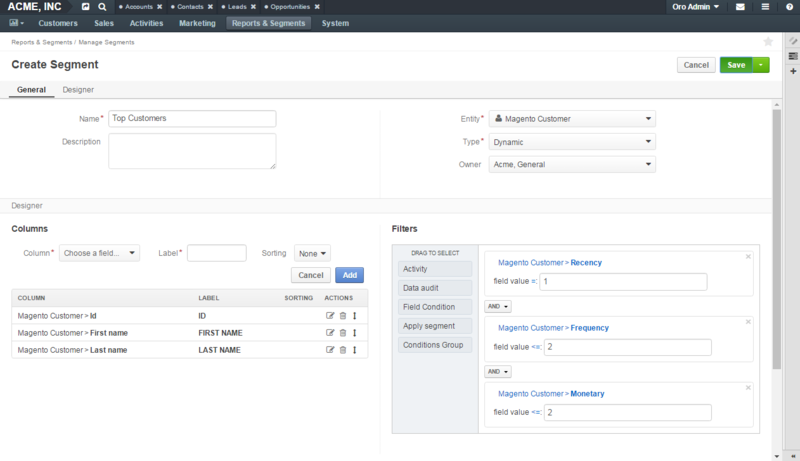 In the Filters section, use the Apply Segment filter and select the “Top customers” segment for it. For more details about reports and their creation, please see the Reports topic. Click on the required Magento customer from the list. You can see the RFM cell under the customer name in the top right corner of the page. 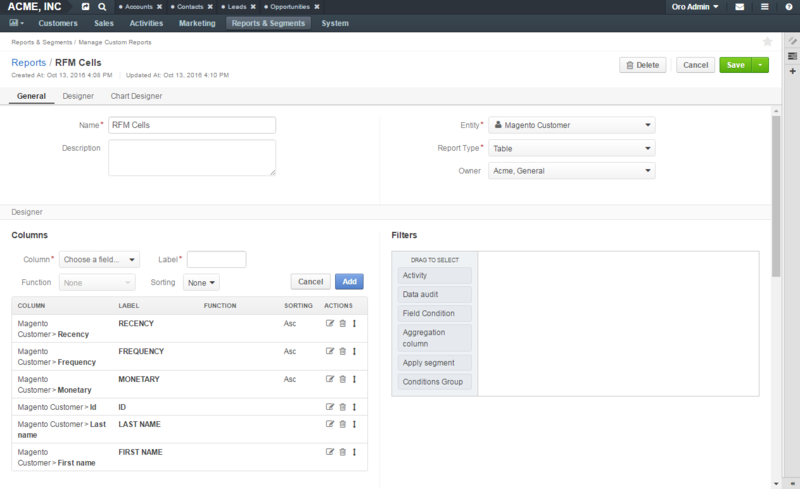 Navigate to Customers > Accounts in the main menu. Click on the required account from the list. 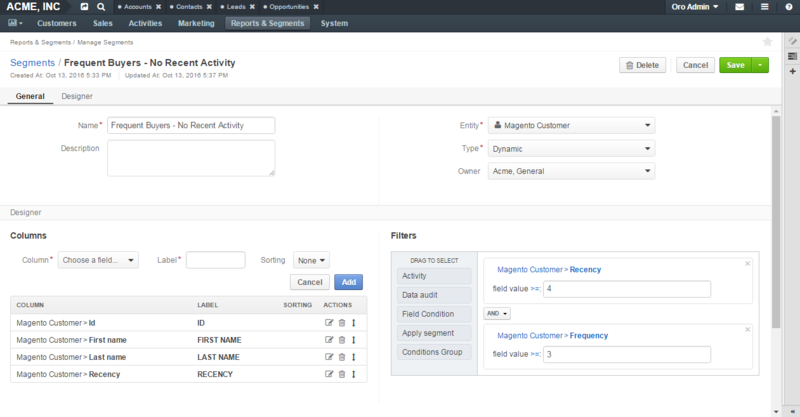 In the sections menu, click the name of the required Magneto channel. Click the tab with required customer name. 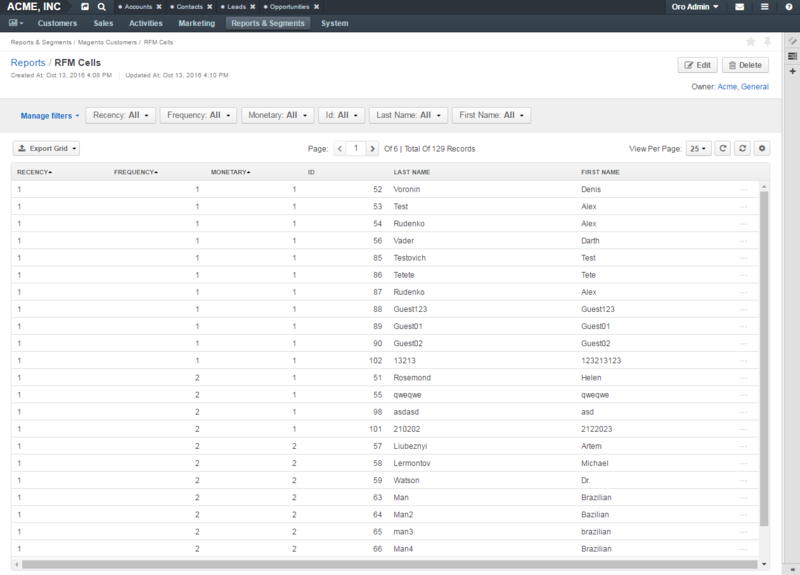 The RFM cell is displayed in the top right corner of the customer tab. It is possible that the same customer is displayed in the account as belonging to different channels. 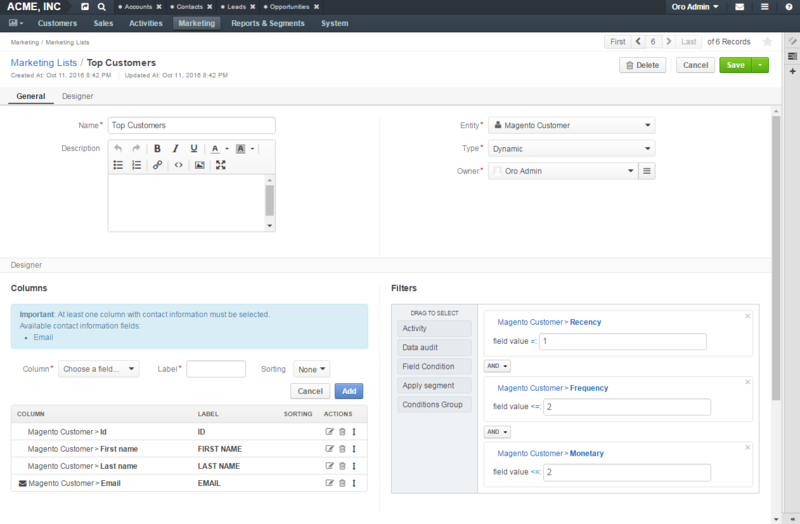 For example, the data from two Magento web stores is loaded to OroCRM via two different channels. And the same customer (identified by the name and email, for example) makes orders in the both web stores. RFM segments are defined per channel, thus customers of each channel are likely to be segmented based on different thresholds. Order history data differs for each channel.